But don't lose hope! Here are some tips to help you find parking Grand Rapids. With the closure of two parking lots in the heart of downtown, parking in Grand Rapids has become difficult to come by. The decision to close the Area 4 and 5 parking lots comes in preparation for the Studio Park construction project. The lots, located along Oakes Street SW, provide parking for many of the surrounding businesses. The removal of these 580 parking spaces leaves many scrambling for a place to park. While there are other parking ramps throughout the city’s downtown district, many of them have long waiting lists. Some of these lists could leave you without parking for months. If that’s the case, then what options do people have? There are a few other options for people who have lost their parking spots. Read on for ways you can find parking in Grand Rapids. One of the ways to find parking downtown is using mobile parking applications. These apps show you wear parking is available in the city, making your search a little easier. GR Park shows you what spaces are available in the parking ramps around you. Unfortunately, the availability of these spaces varies day-to-day. The rates for these spaces also varies depending on the ramp. Park Mobile allows you to pay for parking meters from your smartphone. Instead of having to run out to your car every two hours, Park Mobile allows you to restart your meter as needed. However, you will still have to find an available meter and pay for it throughout the day. While both of these options may work for some, they’re far from being practical. Especially for those who have to be downtown every day for work. While many of the city’s parking ramps have long waiting lists, there are privately-owned ramps with more availability. While the city may own most of the parking in Grand Rapids, they don’t own all of it. Some options are owned privately by individual companies. For example: the Vandenberg Center Parking Ramp. Located at 111 Lyon Street NW, Vandenberg Center (formerly known as the Fifth Third Center) was acquired by CWD in 2016, adding to its portfolio of downtown buildings. Much like the other ramps and lots, Vandenberg Center offers secure, indoor and outdoor parking in the heart of downtown Grand Rapids without the waiting lists. Finding these alternative options is an ideal solution for those that are downtown every day. Another viable option for those that work downtown is the city’s public transport. The Rapid extends throughout the city of Grand Rapids, offering a simple and affordable way to get downtown. The myStop Mobile app allows you to check detailed route information including arrival times to the stops near you. You can even track the location of the bus you need in real time. Public transportation is the perfect alternative for those that are tired of searching for parking in Grand Rapids. Finding parking can be difficult, especially if the lots around town continue to get closed. While paying for meters and riding the bus are effective alternatives, some still enjoy the convenience of driving and parking. In that instance, options like the Vandenberg Center Parking Ramp are the best choice. If you or your business are searching for parking downtown, give CWD a call for more information regarding pricing and availability. CWD Real Estate Investment is a leading, local real estate investment and property management firm in Grand Rapids. 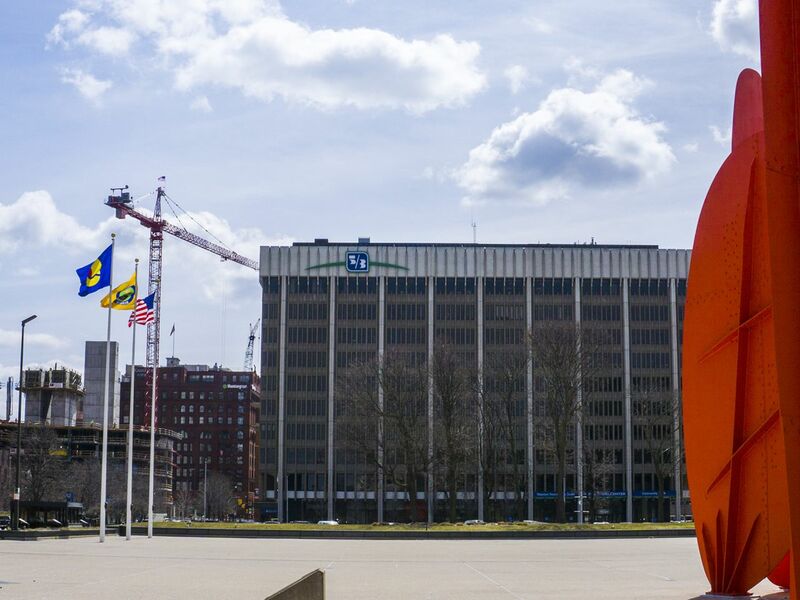 Formed in 2008 by partners Sam Cummings, Scott Wierda, and Dan DeVos, CWD commits to strengthening the urban center and community of Grand Rapids by making strategic investments that provide high-quality places to work, eat, shop, live, and be entertained.